Nothing says summer like taking nibble from a peach, still warm from the sun, that is so juicy it runs down your chin when you bite into it. If you aren’t lucky enough to have a tree in your own back yard, the farmer’s markets are bursting with peaches this time of year. Peach trivia: Peaches were first cultivated in China, where their consumption was documented as early as the 10th century. Peaches were planted in North America in the 17th century, but not grown commercially until the 19th century. Peaches are a member of the rose family. There are over 200 varieties of peaches. Peaches aren’t just delicious – they have a host of health benefits! One medium peach contains about 40 calories, no fat, and 9 grams of carbohydrates. Peaches are very high in Vitamins A and C.
Eating a peach after a spicy meal can help with digestion. Peaches are loaded with phytonutrients, anti-oxidants and carotenoids. Peaches can assist with maintaining a healthy blood sugar level. Choose a peach that is firm, but not hard. Be gentle when checking out peaches – they are delicate and bruise easily. Peaches make a great addition to the lunchbox, but pad them carefully by wrapping them in a cloth before packing them. Clingstone peaches are sweeter and juicier, but if you are home-processing a large number of peaches, freestone varieties are far easier to separate from their pits. One of our favorite uses of peaches that have become a little bit overripe are peachsicles. 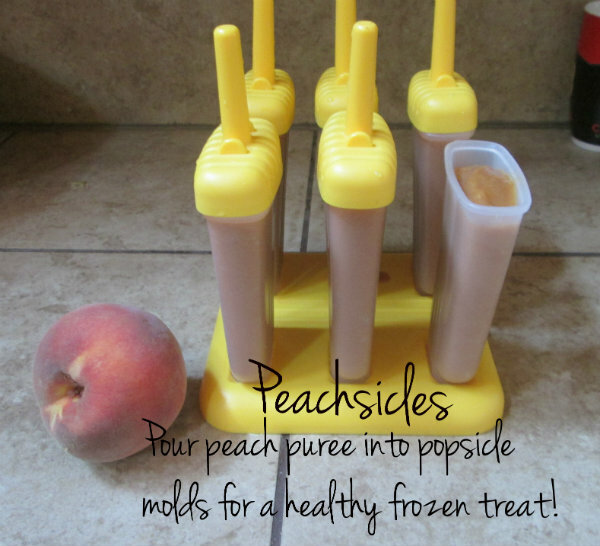 It couldn’t be easier – puree peaches in the blender and pour them into your homemade popsicle forms. I don’t think they need any enhancement, but you could add some raw honey if you require more sweetness. You can also freeze well pureed peaches and add the cubes to iced tea. When freezing peaches, you should remove the skins. To easily do this, cut an X on each end with a knife, then drop them into boiling water, blanching them for 1-2 minutes. Immediately dunk them into an ice bath. Once they are cool, the skins should simply rub right off. Remove the pits and slice or chop as desired, then freeze them in liquid (either white grape juice or a light syrup) in a freezer bag. Freezing them in liquid helps to prevent freezer burn. Drying peaches is easy and results in a delicious treat. Peel the peaches as above, then cut them into 1/8 inch thick slices. Place in a single layer on the rack of the dehydrater and dry on low for approximately 20 hours. Try canning sliced peaches or turn your bounty into a decadent jam. To can sliced peaches, make a light syrup by adding 2 cups of sugar (I recommend organic turbinado) to 6 cups of water and bring it to a boil. Ladle the syrup over the peach slices, then process quart jars in a water bath canner for 35 minutes, adjusting for altitude. Alternatively, process them in a pressure canner at 5 pounds for 10 minutes, also adjusting for altitude. 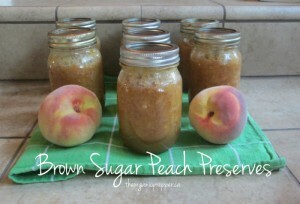 Approximately 3 large peaches fit snugly into a quart jar. 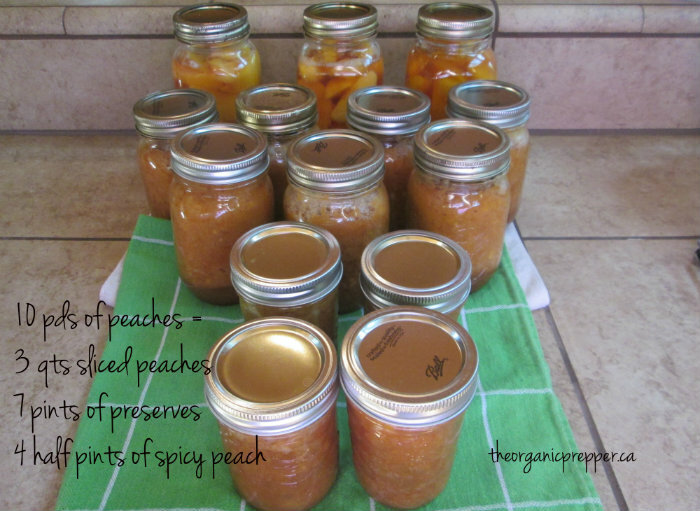 Here are some step-by-step instructions for canning peaches. 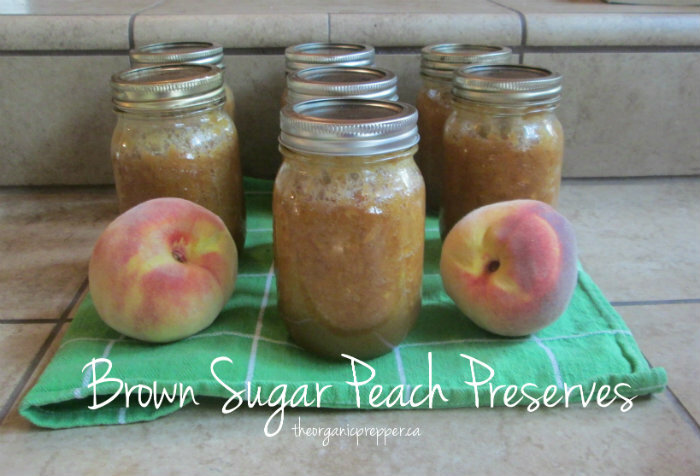 And here are my favorite peach jam recipes. In a small bowl, use a fork to mix ¼ cup of the white sugar with one packet of pectin. In a stockpot, stir the peach puree, peach chunks, lemon and pectin together well. Bring the mixture to a boil over medium heat, stirring frequently. Once it is boiling, stir in the brown sugar and the rest of the white sugar and return to a boil for one minute. Test your jam for thickness. If necessary, add extra pectin and boil for a few more minutes. This is a holiday favorite at our house. I use half pint jars, which is the perfect amount to pour over cream cheese or yogurt cheese. This sophisticated appetizer is best served with simple, hearty whole grain crackers. The recipe is identical to the Brown Sugar Peach Preserves above aside from the addition of jalapenos at the end. In fact, you can ladle out your preserves into jars and then add jalapenos to the remaining jam for two flavors in one batch. Once it is boiling, stir in the jalapenos, brown sugar and the rest of the white sugar and return to a boil for one minute. Test your jam for thickness. Today I brought home 12 pounds of peaches. I put aside some to enjoy fresh and made peachsicles. 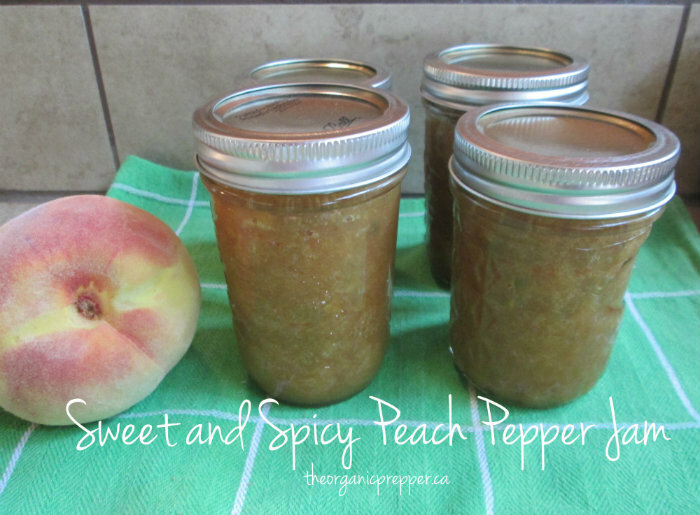 With the rest, I canned 3 quarts of slices, 7 pints of Brown Sugar Peach Preserves, and 4 half pints of Sweet and Spicy Peach Pepper Jam… I spent $10 on peaches for these additions to my food storage pantry. Written by: Daisy Luther on August 29, 2013.